Looking for a quick and accurate way to raise applications for payment and calculate variations, that will also give you a better chance of getting paid on time? Ensign’s mechanical quantity surveying software seamlessly integrates with our mechanical estimating software and will pull through schedules of rates, job and section values for you, saving you time when setting up your job. 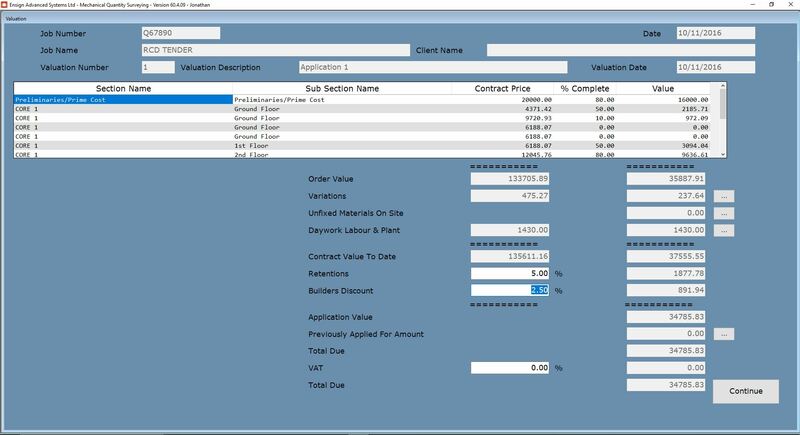 Raising applications for payment is a simple yet comprehensive process with our QS software, which takes account of additional variations, day-work, plant hire and more, to ensure your valuation accounts for everything you have done to date. Not only will that save you a whole lot of time instead of having to do things manually, but it will also help you to justify your applications for payment and ensure a greater chance of getting paid the right money on time. You can calculate variations on the job quickly and accurately, and the Ensign Quantity Surveying Software makes light work of adds and omits, and star rate items too, whilst providing detailed reports to help you justify your variation accounts. Used in conjunction with Ensign’s PDF TakeOff Software, variations can be measured directly on the drawing which can be imported into the QS system to provide instant variation calculations, and the same PDF can be used as a record of the variation or as further proof of the variation itself. As always, with Ensign, we take the time to provide personalised set-up and bespoke training on our software alongside our comprehensive support as standard, whenever you require it, to make sure you make the most of our software and increase the efficiency of your business. Why not give us a call and increase your chances of getting paid on time today?